Mature Height 40 - 70 ft. Mature Width 20 - 40 ft. 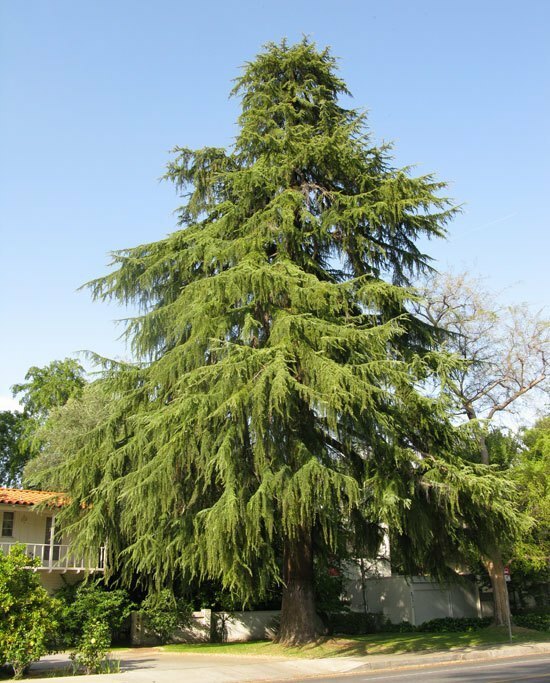 The Deodar Cedar is the perfect evergreen for a dramatic specimen tree in a larger garden. 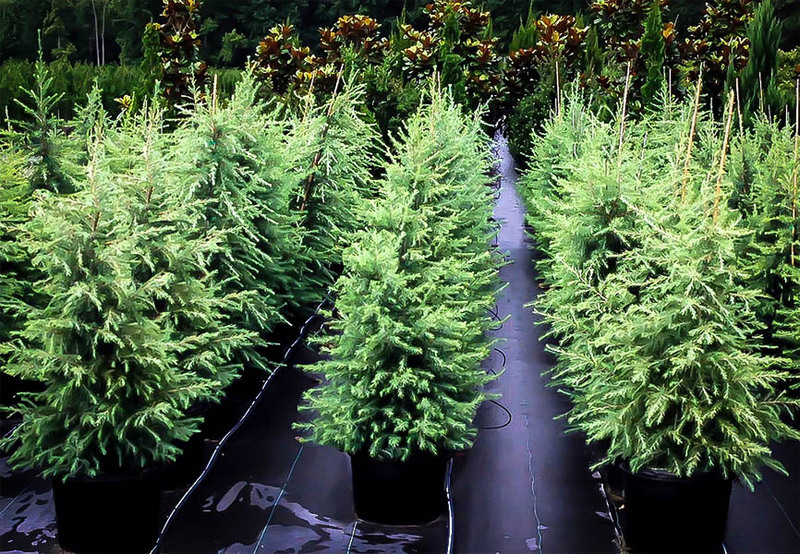 Unlike other evergreens that are often rather plain upright or rounded trees, this tree has the most gorgeous and elegant form, with broad, widely-spaced horizontal branches and slightly pendulous younger shoots. Older trees have large cones arranged upright along the branches. This tree has been loved for 200 years in Europe and America, having been brought over from its natural home in northern India. It grows as much as 2 feet in a year, so it will soon mature from a lovely young tree into a mature specimen that will grace your garden with eye-catching drama and beauty. This tree is widely regarded as the most beautiful of all the evergreen trees. If you need the perfect lawn specimen for a larger property, you have just found it – this tree is so beautiful you will celebrate the day you planted one. Deodar Cedar will grow well in all the warmer parts of the country, thriving in most soils and free of serious pests or diseases. It is hardy to between 0 and minus 10 degrees and is drought resistant when established. It will grow in soils from sand to clay, and after some initial regular watering it will just thrive and grow with no attention or trimming needed to develop. Every tree matures into a unique individual form and each one really is a thing of plant of great beauty. 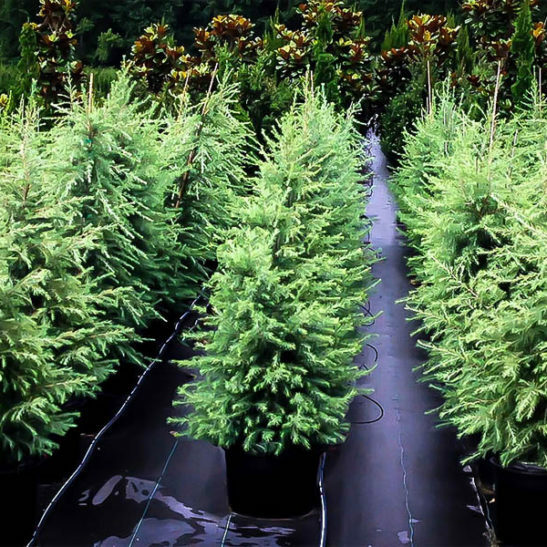 Evergreen trees are useful as backgrounds and screens, but although there are many different kinds, a lot of them are basically upright or rounded, and few have exciting and interesting appearances. 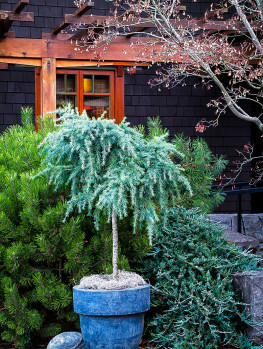 The Deodar Cedar is different – a beautiful and elegant tree with an open, spreading form, horizontal limbs with weeping smaller branches, and soft, grey-green needles that are attractive all year round. 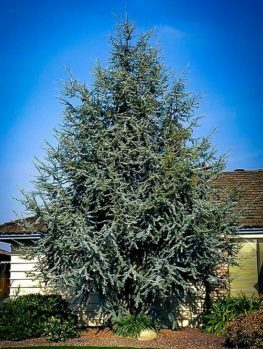 Indeed, there are few if any trees as graceful and attractive as the Deodar Cedar, making this a ‘must have’ tree for any garden large enough to grow it. Among experienced gardeners this is seen as one of the most beautiful trees in the world, and specimens are highly valued wherever they grow. A number of different evergreens go by the name of ‘cedar’, but the Deodar Cedar (sometimes called Himalayan Cedar or simply Deodar) is a ‘true’ cedar, as can be seen by its name – Cedrus deodara. The name ‘deodar’ means ‘timber of the gods’ in Sanskrit, and this tree has always been held sacred. With its close relatives the famous cedar of Lebanon mentioned in the Bible, and the Atlas cedar, cedar trees grow from the Mediterranean to China, with the Deodar Cedar growing from Afghanistan, through the northern parts of India and into Tibet. It was introduced into Europe and England in the early 19th century, and from there into warmer parts of North America. Although a little less hardy than the other true cedars, the Deodar Cedar is arguably the most beautiful of them all, with a softer, more graceful outline, especially when younger. So even as a young tree it will be a charming addition to your garden, developing rapidly and growing as much as 2 feet in a year, until it becomes a wonderful specimen that will be a favorite. 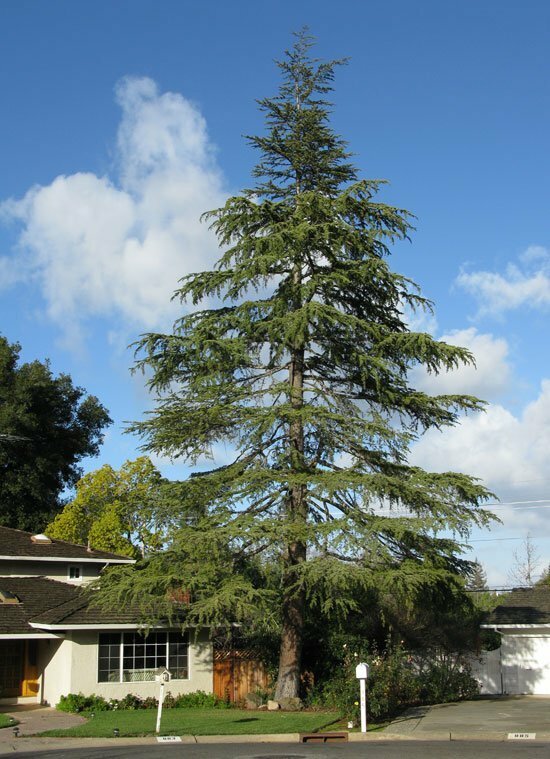 The Deodar Cedar grows in nature into a tree as tall as 200 feet, but in gardens it generally grows between 40 and 70 feet tall, with a spread up to 40 feet across. So allow plenty of room when planting for it to develop its full, spreading form. The bark is grey-brown and smooth, becoming furrowed with age, and younger trees have a broad pyramidal form, developing in time a flattened top. The main branches are spread out and horizontal, with the smaller branchlets slightly weeping, which is why this tree is so graceful. The needles are 1 to 2 inches long, grey-green in color, and in clusters along the stems. 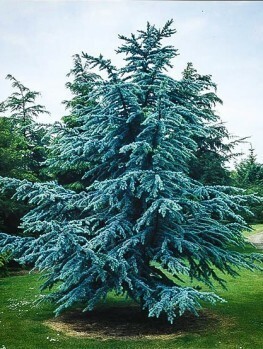 The Deodar Cedar is an ideal specimen to plant in a large lawn, as the open branches do not put too much shade on the grass, and it can also be planted as a screen or avenue. It can also be grown for a number of years in a large container, and even turned into a dramatic bonsai tree. 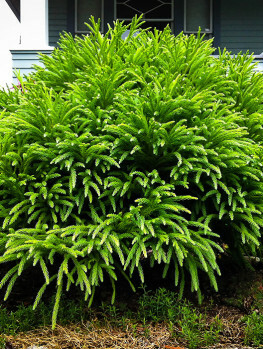 Of all the cedar trees, this is the most attractive even when young, so right from the moment you plant it you will have a lovely plant you can be proud to grow. Our plants have been perfectly developed by an experience grower who produced plants taken only from the best and most attractive mature specimens. 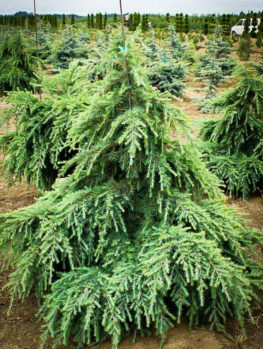 Deodar Cedar will grow well in almost any soil, but it will not thrive in soil that is regularly waterlogged or wet. Your young tree should be watered regularly for the first few years, but after that established trees are very drought-resistant and thrive in hot locations, although this tree also grows well in area with cooler summers. It is hardy to zero degrees, or even as low as minus 10 degrees, so it will grow well in zone 7 and also in sheltered locations in zone 6. It is a good idea to stake a young tree upright and only allow a single stem to develop, as trees with a central trunk are more attractive than those with two or three main trunks. Older trees carry attractive cones up to 4 inches in length, and these stand upright on the branches like fat candles. 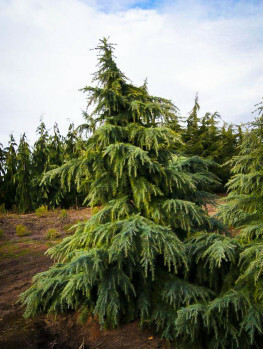 The Deodar Cedar has no serious pest or diseases, needs no trimming and after that early staking it can be left to grow more beautiful every year with no care needed from you.